The Heart Meridian connects with the Small Intestine Meridian, with which it is externally-internally related. 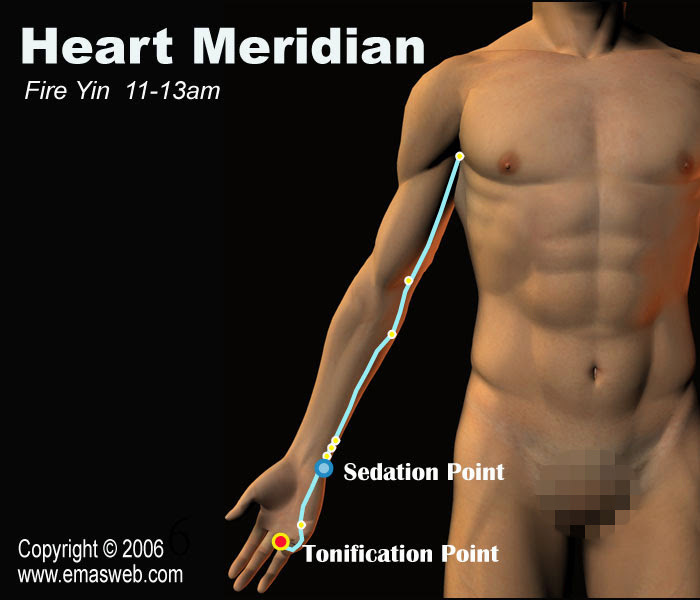 Abnormalities of the Heart Meridian may result in pain of the heart region (chest). Based on traditional Chinese medical theory, the heart governs the blood and vessels. If there is poor blood circulation, the blood cannot moisten and nourish. This may cause dry throat and thirst. Pain of the elbows and a sensation of heat in the palms also show an abnormality in the Heart Meridian. Heart Meridian abnormalities can also affect the vessels, brain, thyroid gland, mental state and so on. Because the Heart has its ‘opening’ in the tongue and the channel goes to the tip of the tongue, abnormalities of the Heart Meridian can lead to stiffness of the tongue and affect the functions of taste and speech. Peak qi and blood flow in the Heart Meridian is from 11:00 am to 1:00 pm, noon. 1.Diseases of the chest, heart, and circulatory system. 2.Diseases of the nervous system and psychiatric problems. 3.Diseases along the course of the Heart Meridian.